Questions, contradictory narratives and, above all, calls for calm energize the daily coverage and debate over the armed self-defense phenomenon sweeping parts of Mexico. For their part, corporate media outlets like Televisa play up the deployment of federal police and soldiers to the Tierra Caliente of Michoacan, one of the epi-centers of the movement, graphically displaying the march of the federales in stark digital maps, while stressing proclamations from President Enrique Pena Nieto and his top officials that the federal government has taken charge of the violence-ridden region. “The Mexican state is the only one responsible and the only one with attributions for really establishing security conditions in Michoacan,” President Pena Nieto affirmed while speaking at the recent world economic forum in Davos, Switzerland. Nonetheless, the civilian self-defense groups continue expanding in not only Michoacan but to other parts of the country as well. In fact, one such movement is on the verge of carrying out an unprecedented thrust into a major city. Essentially, the discourse on the self-defense movements and their confrontations with different organized crime groups exists on two levels: an elite national and international opinion arena in which legality, institutional legitimacy and governability take precedence and a popular one in which survival, resistance and corruption fatigue predominate. Even as the Mexican government and Michoacán’s Tierra Caliente self-defense groups signed an 8-point accord January 27 to institutionalize the ostensibly illegal organizations and draw them safely into state orbit, talk persisted in the self-defense circles of continuing forward with the encirclement and occupation of Apatzingán, the Michoacan city considered the bastion of the Knights Templar syndicate. In the days immediately preceding the agreement, self-defense groups seized the town of Peribán and advanced out of the Tierra Caliente proper to several towns around the highland city of Uruapan. With the latest gains, the Tierra Caliente self-defense movement has upwards of 10,000 armed members deployed in more than 30 municipalities. At the same time, another self-defense movement based in indigenous communities and which predates the Tierra Caliente movement by almost two years is consolidating its presence in Michoacán’s Purepecha Meseta region. In the municipality of Cherán, for instance, local residents have dismantled the former local government, driven political parties from the community and reintroduced a government rooted in Purepecha customs and traditions. In the neighboring state of Guerrero, meanwhile, an estimated 1,000 members of the Guerrero State Union of Peoples Organizations (UPOEG) swept into the Ocotito Valley between Acapulco and the state capital of Chilpancingo January 23, occupying 8 towns and initially detaining 10 alleged delinquents. Unlike the self-defense groups in the Tierra Caliente that have been repeatedly photographed with automatic weapons, which under Mexican law are reserved for the exclusive use of the armed forces, the UPOEG forces were armed with shotguns, .22 rifles and small pistols, some of them reportedly homemade. The UPOEG lost no time in forming three new community police units in El Ocotito –two made up of men and one of women. As in the Tierra Caliente, residents of the Octotito Valley are rebelling against insecurity, extortion and violence, in their case at the hands of an offshoot of the old Beltran Leyva cartel. The Octotito Valley is also the site of an industrial park designed by the state government to bring development to a state largely dependent on tourism and illicit drug revenues. Early last year, the UPOEG began forming self-defense groups in the Costa Chica region of Guerrero, an area some distance from the organization’s latest incursion. Now claiming a force of 6,000 men and women-and growing- the UPOEG is part of a state citizen security and community policing system that is recognized and supported by the administration of Governor Angel Aguirre Rivero. But frictions between Aguirre’s administration and the UPOEG have become increasingly evident. Reacting to news from the Octotito Valley, the governor cautioned against taking justice into one’s own hands. “We live in a state with the rule of law and institutions,” Aguirre insisted. On Sunday, January 26, more than 2,000 people, mainly women and children, marched in El Ocotito in support of the UPOEG. “This is the emancipation of the people of the Ocotito Valley” and “Aguirre Rivero, Guerrero turned out too big for your britches,” were among the chants voiced by demonstrators. In important senses, the UPOEG and other community policing initiatives in Guerrero have a more developed agenda than the Tierra Caliente groups in Michoacan- at least until now. Campaigning for social and economic development, the UPOEG joined with other social organizations in a January 25 march in Tlapa, Guerrero, against high electricity rates. Tensions are also on the rise between the UPOEG and the Mexican army, which in contrast has been very tolerant and even tactically supportive of the Tierra Caliente self-defense forces. The reported arrest of two self-defense members by the army January 27 immediately sparked a community protest and highway blockade in El Ocotito that temporarily prevented a military convoy from moving. On January 28, the UPOEG advanced from the Octotito Valley and took three towns including Mazatlan, which is located only 6 miles from Chilpancingo. Submerged in a familiar spiral of extortion, kidnappings and executions, Chilpancingo could even witness a self-defense uprising, according to some residents and UPOEG leaders. Businessmen in Chilpancingo delivered an ultimatum this week to all three levels of government, demanding the reestablishment of order. Otherwise, the business leaders warned, they would support the entrance of the UPOEG self-defense forces into the state capital. “We only want to live in peace,” insisted business leader Pioquinto Damian Huato. Only a day after making the comments, gunmen attacked Damian and his family while riding in a vehicle. Damian emerged unscathed, but a son was wounded and daughter-in-law Laura Rosas Brito killed. Separately, Damian’s house was shot up. Damian blamed the mayor of Chilpancingo, whom he had previously accused of complicity with organized crime, for the violence against his family. As FNS was going to press, an explosive situation was reported around the Guerrero state capital, with a major military mobilization underway and self-defense forces on the outskirts of Chilpancingo. The Mexican army was also very active in Puebla this month after news broke of the formation of yet another self-defense organization, this one based in the indigenous communities of Tehuacán and the Sierra Negra. As January crawled to a close, the army had reportedly moved into ten communities in Puebla. Some local political leaders criticized the efforts to establish a self-defense group, claiming their localities were tranquil and without major problems. In Michoacan, a thousand questions hang in the air. Dionisio “El Tío” Loya Plancarte, a Knights Templar leader who gained social media fame last year after he appeared in a YouTube video challenging self-defense leader Hipolito Mora to a duel, was detained by the Mexican military only hours before the government and Tierra Caliente self-defense forces signed this week’s 8-point agreement in the town of Tepaltepec. Noticeably, the government did not release a video or photo of the wanted man’s detention on the day of his capture. The January 27 accord institutionalizes the self-defense movement by allowing its members to join a reactivated rural police force, a system first created in the 19th century as an adjunct to the army during the presidency of Benito Juarez and expanded in the 1930s under the administration of President Lazaro Cardenas. The prospective members will have to turn their names over to the Mexican armed forces, as well as register their weapons with the military. The agreement, which contains no timelines or clear mechanisms for independent monitoring, also pledges to audit local governments, alternate justice system officials and punish officials who have committed proven crimes. “We have the same purpose, to end crime,” said Alfredo Castillo, President Pena Nieto’s special commissioner for Michoacan. On a parallel front, Castillo will oversee the infusion of about $300 million in new government social and economic spending for Michoacán. 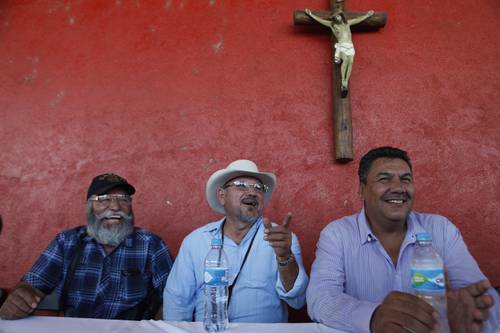 While the Tepaltepec agreement does not immediately change conditions on the ground, Hipolito Mora was among self-defense leaders signing on to the accord that gave a “vote of confidence” to the government. Nevertheless, Mora added, his forces would retain their weapons until all the leaders of the Knights Templar were in custody and the state cleaned-up of criminals. Although the Knights Templar is clearly on the defensive after having suffered the detention of El Tío and other members, most of its leaders are still at large and analysts consider the well-armed organization intact. Additionally, Fausto Vallejo, the controversial state governor, remains in office along with his top officials. Yet even as the ink on the January 27 agreement was barely dry, about 200 members of the self-defense forces occupied the town of Los Reyes and set up checkpoints. On January 28, a new self-defense movement separate from the Tierra Caliente forces had reportedly popped up in a half-dozen communities near Yurecuaro on the Michoacan-Jalisco state line. Interviewed in Puebla, Gustavo Madero, national leader of the conservative National Action Party (PAN), said self-defense groups now existed in 11 states, or a third of the country, reflecting a “very grave” security panorama and a “great institutional crisis” of the state. “There are very strong accusations of corruption, infiltration, and lack of action and authority on the part of local authorities that have to be attended,” Madero said. In remarks made while on a visit to Chiapas, Bishop Raul Vera of Saltillo, Coahuila, said contemporary developments exposed the utter failure of the government’s anti-crime campaign.